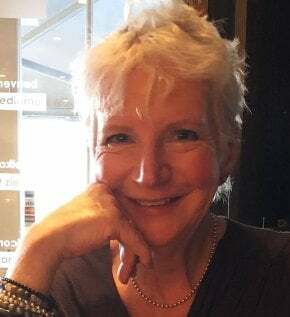 First day of the Country Living Fair today and one of my talks and demos is on one of my very favourite subjects, home fragrance, in fact this is natural festive home fragrance which is even better. Our sense of smell is very closely linked to memory which is why certain aromas have you immediately remembering past events and special people. Those traditional scents of Christmas make me think of happy memories, of Mum and Dad, friends and family and all the gorgeousness that is Christmas. So many people simply opt for store bought pot pourri which is very often merely overly scented wood shavings with a bit of artificial colouring thrown in. Worse are those dreadful wall plug-ins that give your ‘the scent of’ whatever chemically manufactured nastiness is currently in vogue – this time of year it has just got to be festive. These chemical smells can give you a really sore head. Oftentimes people complain of headaches and never for a minute think that they are inviting in the cause of the malady with the chemical fragrances they use at home and also in the car. 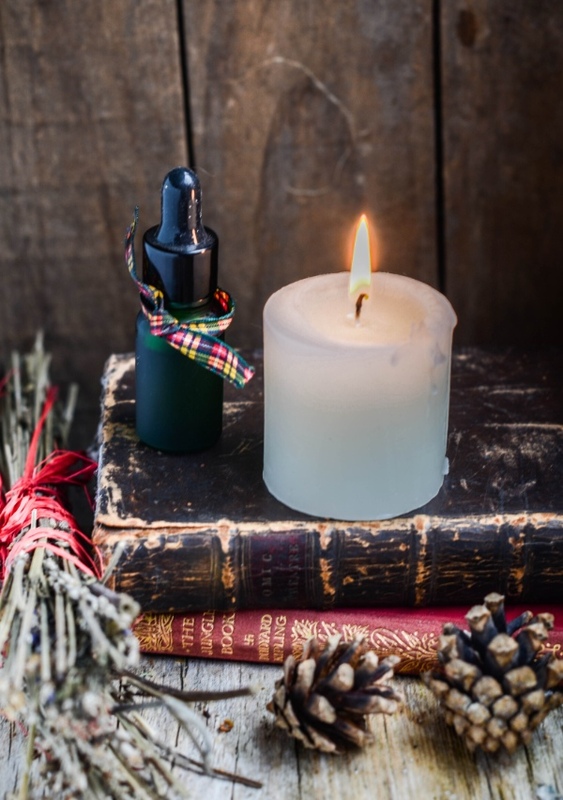 Go for natural festive home fragrance this year and make use of anything that is pourous and can therefore hold a fragrance from pure essential oils. Never by fragrance oils as they are just artificial, instead spend a wee bit more for pure essential oils which have all the gorgeous benefits of the herbs and spices inside them and will last for ages and not give you a sore head either. 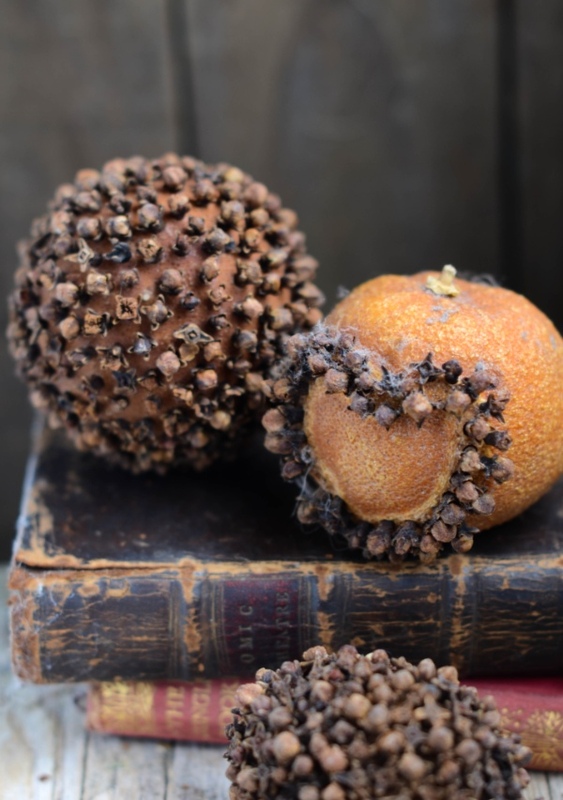 One of the oldest ways to add that touch of festive fragrance at home was to make scented pomanders out of oranges, limes, tangerines and lemons. Just a simple case of stuffing the fruit with cloves and then rolling in cruushed cinnamon for a week and leaving to dry out completely. These old pomanders above have been around for years and still smell fabulous. I love scented candles but I hate those that you buy in the shops. Instead I buy normal candles and let the wick burn till there is a little pool of molten wax about 1cm/1/2″ wide, then I blow out the candle and add a couple of drops of essential oil to the wax pool and relight my candle. Voila a properly naturally scented candle. As I mentioned before anything pourous will homed a scent so think outside the box when it comes to that pot pourri. 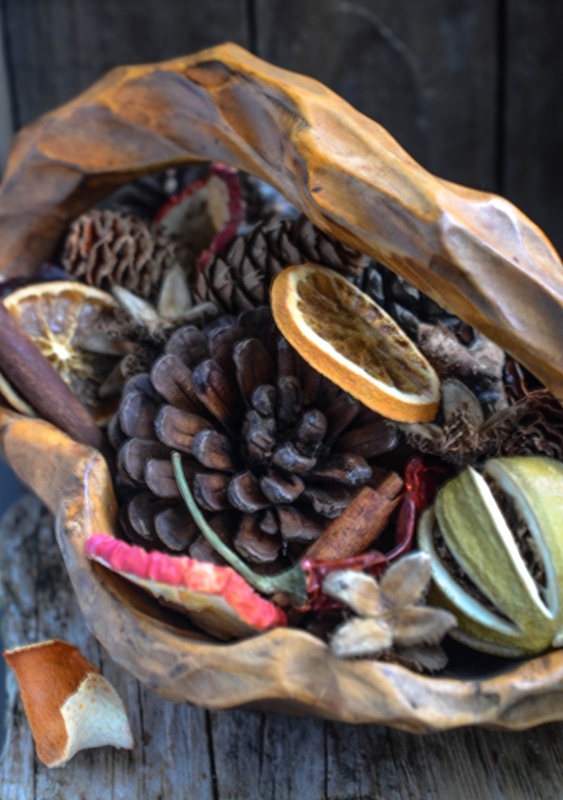 I like to add all sorts of things to my pot pourri, and to make a bit of a Scottish colour statement I often add little tartan rag balls which I spray with my essential oil blend. These little balls are simplicity itself to make and require no sewing at all. Just take a piece of fabric (cotton/wool etc are best but anything will do really) and tear into long strips approximately 1″ wide by 2 ‘ long. Starting at one end tie a lose knot and then another on top of it. This gives a little ball to start rolling the fabric on to. As you roll the fabric keep twisting it and changing direction every few rounds so that you are creating a tight ball shape. When you get to the end of the strip simply tucck the end securely into one of the folds. 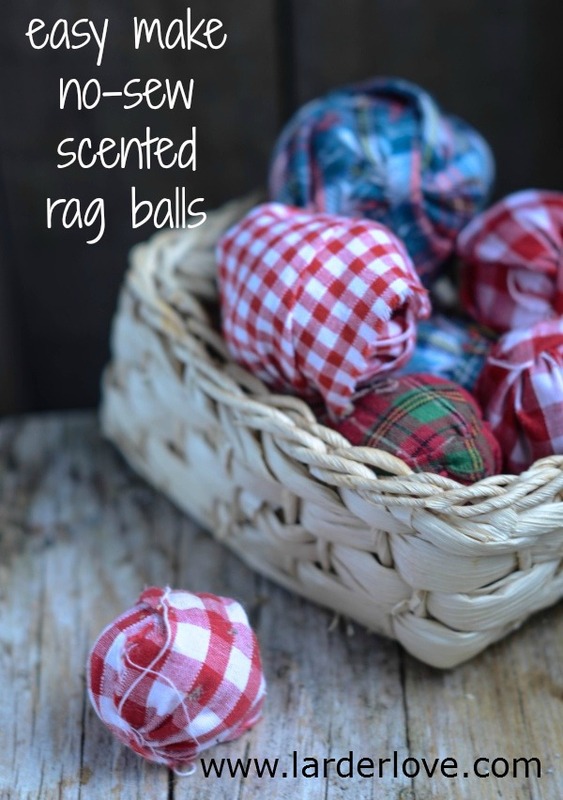 Put all your little fabric balls into a plastic bag and drip or spray with your essential oils. Shake well and leave sealed for 1 week to really let the fragrance soak into the fabric. Then they are rady to add to your pot pourri mixture of cones, oranges, dried chillies etc. 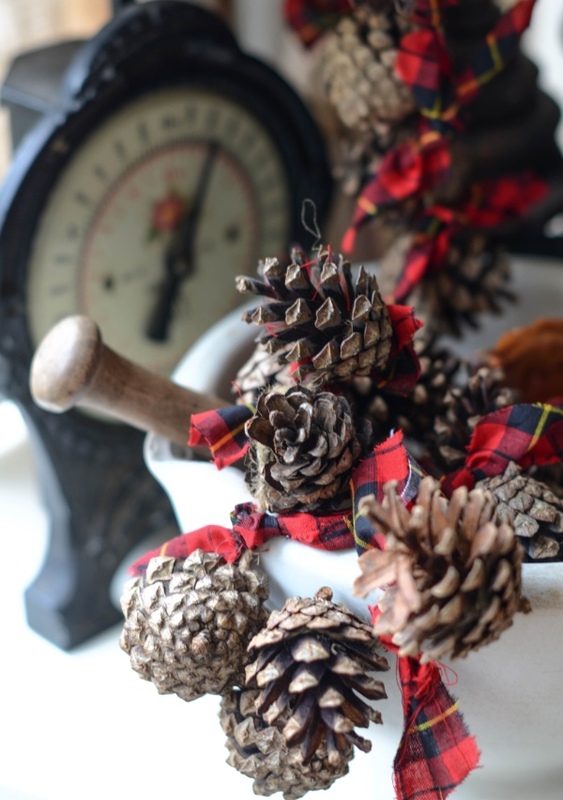 Pine cones are another addition to the natural festive home fragrance armoury and I use loads of pine cones at this time of year. Either as garlands to hang around the house or in bowls with oils as pot pourri. Here I have made a garland by glueing the cones on to a long piece of strong twine and tying snips of tartan fabric between them here and there to brighten them up a bit. I then did the same oil drizzling as I did with the rag balls. 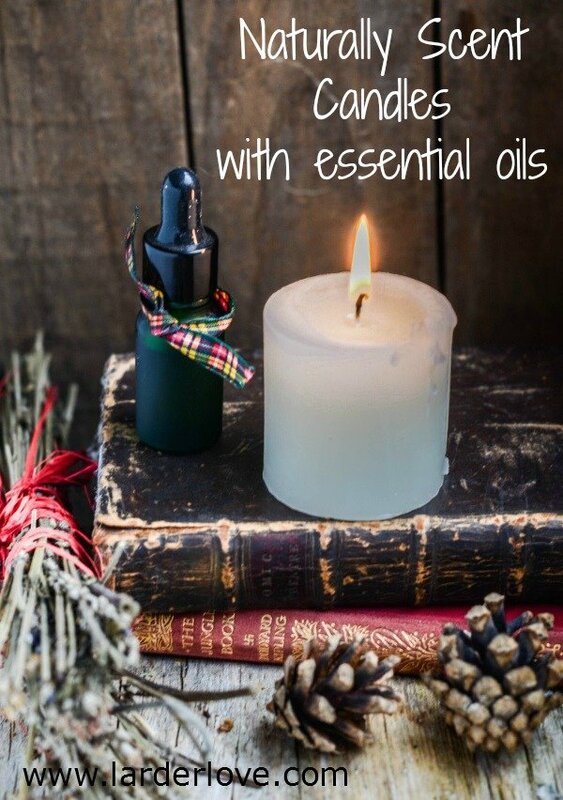 The essential oil blend that I like to use is a mixture of rosemary, lavender, cinnamon, cloves and orange. The final tip, if you really can’t be bothered to do any crafting at all but still want your house to smell festively gorgeous, just put some of this oil blend on a cotton wool ball and tuck it befind your dadiators. When the heating comes on the house will smell amazing, perfect for the hallway at the front door. Love this natural home fragrance suggestions. Last winter I used an orange stuffed with cloves to scent my house. Great to hear that Dan, so much better than commercial stuff isn’t it. I LOVE this pin!! I plan to do this very soon. I actually follow all your boards and find your pins to be very informative and practical. Thanks for all the great info!